The upper temperature tolerance range for Trichomya hirsuta L. is described for acclimation temperatures of 10° to 32°C at 30% S. Changes in thermal resistance with time are described along with the incipient lethal temperatures. The eurythermicity for the species is 240.7 C°-squared. The ultimate upper incipient lethal temperature is 35.1°C. Definition of the incipient sublethal temperature is given, and is equal to 32°C. Diet effects are shown not to be significant in short-term lethal experiments, but indicate that unfed mussels reduce their resistance after prolonged exposure to high temperatures. Size was also shown to have no effect on resistance and tolerance. 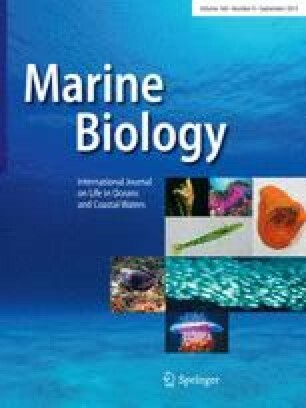 A comparison of the tolerance triangle of T. hirsuta with those of the temperate species Mytilus edulis and Mya arenaria revealed that the 24-h LT50 minus 2.2 C° approximates the incipient lethal temperature. The eurythermicities of the temperate species are Mytilus edulis, 363 C°-squared; and Mya arenaria, 415 C°-squared.